The EUR/RON traded yesterday in the lower half of the 4.6600-4.6700 range where it's been hovering since the beginning of October. The turnover was below average. For today, EUR/RON could test the lower bound of the range given the optimism on the global market, but we doubt that we will see a significant break lower. A quiet day for ROMGBs yesterday with the yield curve little changed. MinFin auctions RON600 million in 2Y bonds today which are likely to see good demand from local banks ahead of RON8 billion benchmark maturity on 28 November and given the supportive liquidity backdrop after the NBR repo auctions. However, after the recent drop in yields, the cut-off yield should come within the secondary market bid-offer spread of 3.80%-3.75% depending on the MinFin decision to upsize the allocation. The NBR Inflation Report is due for release today and we expect a slight upward forecast revision for the short-term projection, with the medium-term outlook unchanged. The O/N implied yield was little changed yesterday around 2.80%. 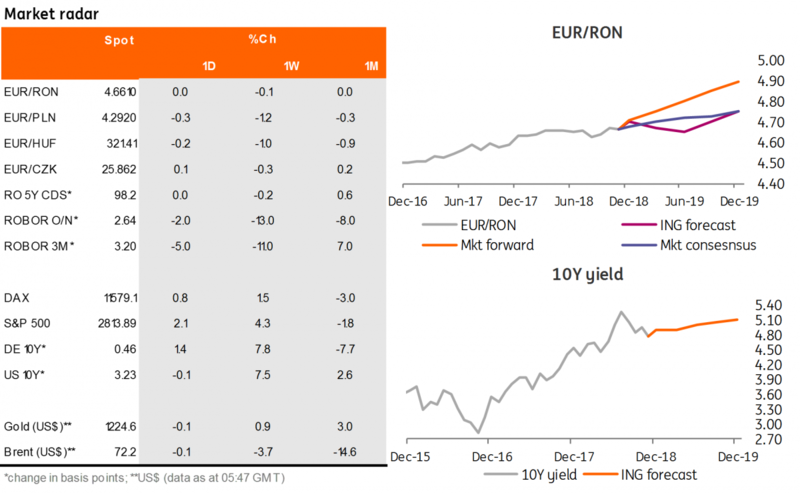 The money market yield curve saw some flattening as selling interest emerged in the 6M-1Y segment, pushing yields 4-7 basis points lower.